Who would’ve thought Ramses II and Moses from The Ten Commandments would be together again to fight the Battle of New Orleans together in the 1958 film The Buccaneer? Of course, if there are any movies based in this era, this movie and it’s 1938 premake with Frederich March, are probably the best you’re ever going to get in terms of historical accuracy. 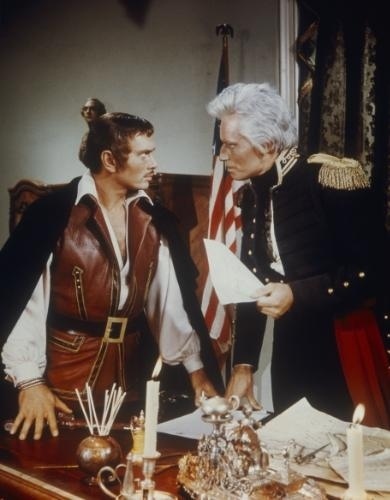 Still, Yul Brynner’s character is a French pirate named Jean Lafitte whose services were vital to Charlton Heston’s Andrew Jackson (which is well cast despite the hilariously botched make up job) winning the Battle of New Orleans. Had Lafitte had not intervened, the British might’ve won and American history would’ve taken a very different direction. While there aren’t many movies made covering the US between the end of the American Revolution and the War of 1812 (and the ones we do have tend to be rather inaccurate), these years tend to be trying years for the new United States (yet, why Hollywood doesn’t do many movies on these years I have no idea since there’s much creative potential). In the 1780s, the US was under the system of government known as the Articles of Confederation, which was a loose set of rules for the nation that wasn’t very effective, which was shown by Shay’s Rebellion in Massachusetts. So the summer 1787, a bunch of delegates gathered in Philadelphia to draft a new constitution with a stronger federal government which the United States pretty much runs on today. In 1789, George Washington would be elected America’s first president (in a modern sense) who would set precedents in the American presidency which are still followed today as well as Alexander Hamilton’s financial system. Still, this is an era when the US comes into its own as a nation with things like the XYZ Affair, the Whiskey Rebellion, clashing with the Barbary pirates, the Louisiana Purchase, the Lewis and Clark Expedition, Marbury vs. Madison, and finally, the War of 1812. Yet, many of these subjects don’t have their own movies to them for some reason. Yet, ones that do have a lot of inaccuracies in them which is a shame because this is a very important time in American history and knowledge of it shouldn’t be confined to an American classroom. Cool photo of Charleton Heston and Yule Brenner. I have never seen Yule with hair before.